Prof. Dr. Khan Abdul Hai has joined Glocal College of Unani Medical Science & Research Center as Professor & Principal in 1st Jan.2013. He has been engaged in administration, teaching & research for nearly 25 Yrs. Prof. Dr. Khan Abdul Hai is alumnus of prestigious Unani Medical College. He graduated in Unani Medicine in the years 1985, was appointed Lecturer/ Assistant Professor and promoted to post of Associate Professor, Professor and Head of Department in the Unani College. 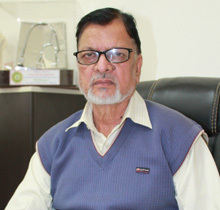 Dr. Khan Abdul Hai has published two research papers in reputed National Journals with title History of Medicine and Alcohol Dependence. He has also worked as examiner (Hygiene), paper setter (Kulliyat) in Rajasthan Ayurved University Jodhpur and in Bengal University during 2005-2008. He has delivered several guest lectures in Unani Medical College. His entire work concerns with Unani Medicine. He is himself a diligent personality of Unani Medicine.